Three first-half tries handed England a 32-3 victory over hosts Argentina in the first of their two-match series in Salta. Stuart Lancaster’s side stormed out of the blocks in the opening 40 minutes to rack up tries through David Strettle, Billy Twelvetress and Ben Morgan – the latter pair particularly impressive throughout on their return to Test rugby. Argentina were without 21 of their leading stars, all rested for the Rugby Championship, and the rustiness in their set-piece game hounded them throughout as considerably more line-outs were lost rather than won. England were not so lackadaisical. The power of Morgan reminded everyone of what England had been missing throughout their Six Nations campaign, the Gloucester number eight rampant from the base of the scrum and in the loose. 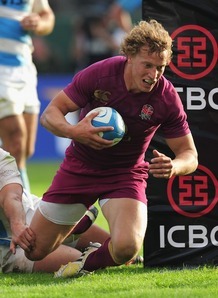 Twelvetrees’ step and handling also showed that perhaps England’s approach of physicality first in midfield should be consigned to the past, his footwork and distribution leaving Argentina ragged. For all of their first-half excellence however, England struggled to add more points in the second period until Vunipola’s late score as Argentina rallied. The English scrum – a concern in the local press beforehand – proved dominant early on and provided England with their first points of the match after Burns landed two long-range penalties from nearly halfway within three minutes. A first try shortly followed. Turning over ball at the line-out, England countered through Christian Wade, setting up the platform for Jonathan Joseph to fix the defence and hand Strettle a finish in the left corner. Further struggles for the Pumas at the line-out kept them under the cosh, England breaking through Twelvetrees in an attack that culminated eventually with a score for Gloucester centre – England’s patience and precision with their offloading game too much for Argentina’s defence to handle. Full of confidence, England’s precision evaded them in the build-up to a possible third try that would have put the game to bed, the visitors instead leading 18-0 after half an hour. Morgan had been England’s outstanding performer thus far and he capped it with a try in the right-hand corner, leaving Argentina on the ropes. The hosts did finish the half with something to hold on to, a Martin Bustos Moyano penalty putting them on the board but a long way behind with the score standing at 25-3. Bustos Moyano didn’t help matters with two missed penalties early on after the interval – Argentina enjoying more possession but failing to convert it into points. England nearly countered with a breakaway try, the footwork and passing of Morgan, Twelvetrees and Joseph creating an opportunity before the final pass eluded Strettle into touch. More frustation followed – only a forward pass denied Twelvetrees a second try with the posts at his mercy as England’s first-half precision abandoned them. Argentina had been searching for some precision of their own in the set-piece all match long and their line-out continued to stutter, ironic cheers coming from the crowd when possession was actually retained. Their scrum was no different, England repelling pressure within their own 22 as the Pumas looked less like scoring as the match wore on. Tempers had threatened to boil over throughout and as England struggled to add to their tally and were left frustrated, Courtney Lawes being sent to the sin-bin. With England’s defence impregnable and Argentina unable to convert their growing wealth of possession, Vunipola crossed to finish off the closing quarter – English minds looking ahead to the second Test in Buenos Aires and a first ever series victory on Argentinian soil.